They work it right toward Folau, but it doesn't quite get there. They recycle it left to Ashley Cooper and he gets crunched. Good period of possession here for the Wallabies. They keep trying to get the ball to Folau, but keep coming up short. 10m out now right infront. James O'Connor gets that consolation, and the conversion will be the last play of the game. Not a lot of celebration from the Aussies after that try. They are now in a full team embrace, but I can imagine the words being spoken aren't the happiest. The conversion is good but for Aussie the result is bad. The full time whistle sounds, the All Blacks have won 47-29. The final whistle has gone. That's it. Thanks everyone for joining me tonight, I hope you have enjoyed our coverage. Make sure you check Wynne Gray's match report that will be online shortly, and all of Gregor Paul's analysis in tomorrow's Herald on Sunday. COMMON Sydney Crowd. NEVER BOO your team,,, esp. when they did they the very best against the VERY BEST. I will be back again tomorrow to cover the Warriors from 3.30pm when they take on the Panthers. See you all then? Thanks..I have really enjoyed the game and the blog! Sydney Morning Herald says conversion missed on full time and final score 47:27. I can't wait to read Wynne's report! Well played AB and thanks for the updates..
Otago..that was the kiwi fans in the crowd booing Quade..not sydney booing their own team. thank you so much steven for the updates!! 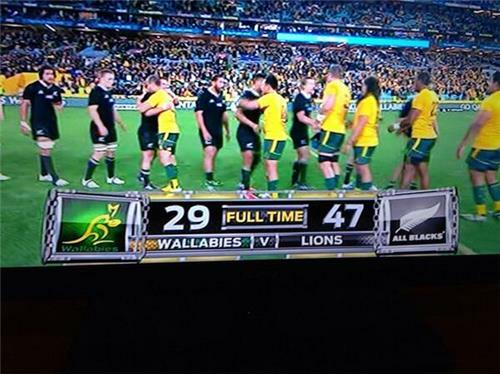 Well done to the All Blacks and well played the Wallabies however Australian no team deserves to be booed ever. Your team played with all of their hearts. Thanks to all the players for the wonderful sportsmanship.